These comprise 1-2% of all malignant tumours, and the male/female ratio is 2 : 1. Renal cell carcinomas (previously called hypernephromas or Grawitz tumours) arise from proximal tubular epithelium. They are the commonest renal tumour in adults. They rarely present before the age of 40 years, the average age of presentation being 55 years. The tumours may be solitary, multiple or occasionally bilateral. The tumour lies within the kidney but it may eventually penetrate the capsule. Macroscopically, its cut surface appears as a yellow mass, sometimes containing areas of haemorrhage and cystic degeneration. 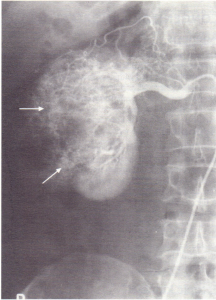 Local invasion of renal veins and spread to the opposite kidney may occur, as may metastasis to lymph nodes, liver, bone and lung (often as an apparently solitary metastasis). Renal cell carcinomas are highly vascular tumours. Microscopically the tumour is composed of large cells containing clear cytoplasm. Patients present with haematuria, loin pain and a massin the flank. Malaise, anorexia and weight loss may occur, and occasionally patients present with polycythaemia . Pyrexia is present in about one-fifth of patients and approximately one-quarter present with metastases. Rarely, a left-sided varicocele may be associated with leftsided tumours that have invaded the renal vein and caused obstruction to drainage of the left testicular vein. Excretion urography will reveal a space-occupying lesion in the kidney; 10% of these show calcification. Ultrasonography is used to demonstrate the solid lesion and to examine the patency of the renal vein and inferior vena cava. CT scanning can also be used to identify the renal lesion and involvement of the renal vein or inferior vena cava. MRI is proving to be better than CT for tumour staging. 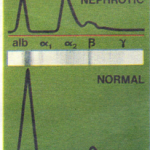 Renal arteriography will reveal the tumour’s circulation. Urine cytology for malignant cells is of no value. The ESR is usually raised. Treatment is by nephrectomy unless bilateral tumours are present or the contralateral kidney functions poorly, in which case conservative surgery such as partial nephrectomy may be indicated. If metastases are present, nephrectomy may still be warranted since regression of metastases has been reported after removal of the main tumour mass. Severe flank pain may also demand nephrectomy despite the presence of metastases. Radiotherapy has no proven value. Medroxyprogesterone acetate is of some value in controlling metastatic disease. Treatment with interferon-a produces up to a 20% response rate in the short term. The prognosis depends upon the degree of differentiation of the tumour and whether or not metastases are present. The 5-year survival rate is 60-70% with tumours confined to the renal parenchyma, 15-35%, with lymph node involvement, and only approximately 5% in those who have distant metastases. This tumour is seen mainly within the first 3 years of life and may be bilateral. It presents as an abdominal mass, rarely with haematuria. 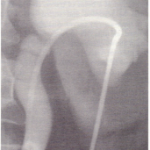 Diagnosis is established by excretion urography followed by arteriography. A combination of nephrectomy, radiotherapy and chemotherapy as much improved survival rates, and the majority of children, even those with metastatic disease, are cured. Renal arteriogram in a patient with renalcarcinoma. Note the abnormal tumour circulation. Benign adenomas are usually an incidental finding, presentingas a space-occupying lesion on excretion urography. They seldom cause symptoms. On urography they may be difficult to distinguish from a renal cell carcinoma. Differentiation of benign renal cyst from malignant tumour If a space-occupying lesion is a chance finding on excretion urography in a patient with no relevant symptoms and no haematuria, ultrasonography should be carried out. If the lesion is transonic with no features suggesting a tumour, no further investigation is required. If haematuria has been present, a needle should be inserted into the transonic lesion and cyst fluid aspirated and examined for malignant cells. Contrast medium may be injected to delineate the walls of the cyst. Lesions shown to be solid or non-homogeneous on ultrasonography require further investigation by CT or arteriography. The calyces, renal pelvis, ureter, bladder and urethra are lined by transitional cell epithelium. Transitional cell tumours account for about 3% of deaths from all forms of malignancy. Such tumours are uncommon below the age of 40 years, and the male/female ratio is 4 : 1. Bladder tumours are about 50 times as common as those of the ureter or renal pelvis. EXPOSURE TO INDUSTRIAL CARCINOGENS such as f3- naphthylamine and benzidene. Workers in the chemical, cable and rubber industries are at particular risk. EXPOSURE TO DRUGS, e.g. phenacetin, cyclophosphamide. CHRONIC INFLAMMATION, e.g. schistosomiasis (usually associated with squamous carcinoma). Painless haematuria is the commonest presenting symptom of bladder malignancy, although pain may occur owing to clot retention. Symptoms suggestive of UTI may develop in the absence of significant bacteriuria. In patients with bladder cancer, pain may also result from local nerve involvement. Presenting symptoms may result from local metastases. Transitional cell carcinomas in the kidney and ureter may present with haematuria. They may also give rise to flank pain, particularly if urinary tract obstruction is present. Cystoscopy may be omitted in men under 20 and women under 30 years if significant bacteriuria accompanies the haematuria and both cease following control of the infection, and if urine cytology and excretion urography are normal. 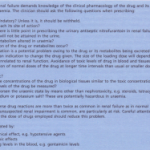 With these exceptions, it is essential that haematuria is always investigated. In cases where the tumour is not clearly outlined on excretion urography, abdominal CT scanning and/or retrograde ureterography may be helpful. These are treated by nephroureterectomy. Radiotherapy and chemotherapy appear to be of little or no value. Subsequently cystoscopy should be regularly carried out, since about half the patients will develop bladder tumours. Treatment depends upon the stage of the tumour (in particular whether it has penetrated the bladder muscle) and its degree of differentiation. Treatment options include local cystodiathermy and/or resection with follow-up check cystoscopies, cytological examination of urine/cystoscopy, cystectomy, radiotherapy, or local and systemic chemotherapy. The prognosis ranges from a 5-year survival rate of 80% for lesions not involving bladder muscle to 5% for those presenting with metastases.